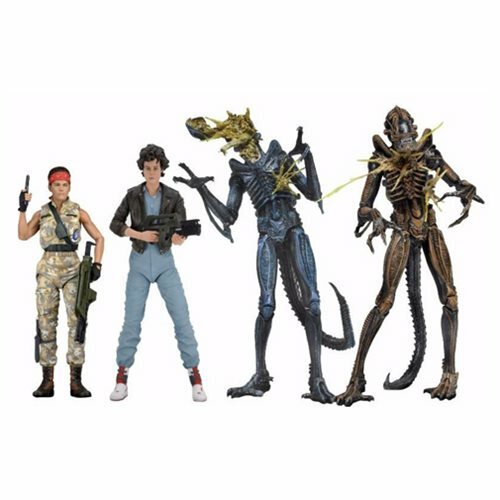 Series 12 includes Lt. Ellen Ripley (Bomber Jacket), Private Jenette Vasquez (BDUs), and two different Battle-Damaged Aliens Warriors. Ripley stands approximately 7-inches tall, has over 25 points of articulation and features the likeness of Sigourney Weaver. She wears a bomber jacket over blue coverall and comes with pulse rifle accessory and attachable muzzle flash. Vasquez stands approximately 6 1/2-inches tall and features the likeness of Jenette Goldstein. Vasquez is seen in her alternate outfit and the Marine gear is completely faithful to the movie, down to the "LOCO" detailing on the back of her vest. Vasquez has over 25 points of articulation and comes with pistol, knife and pulse rifle with attachable muzzle flash. The Xenomorph Warriors feature 2 unique battle-damaged sculpts and stand over 9-inches tall. They utilize the Ultimate Alien body, which has many upgrades, including added articulation and increased range of motion in upper torso and neck, plus a re-engineered tail assembly which provides an additional swivel as well as having a bendable portion with over 30 points of articulation. Each figure comes packaged in clamshell packaging.